Banned Books Week, September 23-29, brings together the entire book community — librarians, booksellers, publishers, journalists, teachers and readers of all types — in shared support of the freedom to seek and to express ideas, even those that may be considered unorthodox or unpopular. The books featured during Banned Books Week have all been targeted for removal or restriction in libraries and schools. By focusing on efforts across the country to remove or restrict access to books, Banned Books Week draws national attention to the harms of censorship. Read a banned or challenged book! The American Library Association's Office for Intellectual Freedom (OIF) receives reports from libraries, schools, and the media on attempts to ban books in communities across the country. 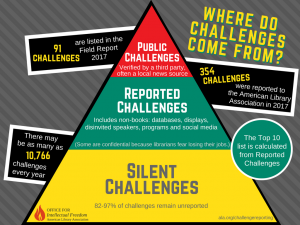 They compile lists of challenged books in order to inform the public about censorship efforts that affect libraries and schools. Peruse these pages to explore banned and challenged books by topic, genre, time, and audience. OPL staff have also created lists of banned or challenged books for kids, teens and adults - all available in OPL's collection. Read this Omaha World-Herald column by OPL Executive Director Laura Marlane about what valuable lessons she learned from reading banned books. Participate in this year's Omaha Reads campaign. The community-selected title, "The Hate U Give" by Angie Thomas, was one of the 10 most challenged books of 2017. Despite winning multiple awards and being the most searched-for book on Goodreads during its debut year, this YA novel was challenged and banned in school libraries and curriculums because it was considered “pervasively vulgar” and because of drug use, profanity, and offensive language. Stand up to censorship and declare your literary freedoms by reading from a banned book or discussing censorship issues on camera. Record a video of your efforts and share it using the tag “Banned Books Week.” Learn more at bannedbooksweek.org/videos.